You must be a member of the Amsterdam Book Group to attend this activity. Would you like to join this group? In Protected content seemingly impossible goal was achieved as Neil Armstrong uttered his immortal line: "That's one small step for a man, one giant leap for Mankind." This year celebrates not only 50 years since Apollo 11 and the first human steps on the Moon, but also the achievements of the all Soviet and American heroes who risked and sometimes lost their lives in the race to the Moon. David Eicher, renowned editor of the world's bestselling Astronomy Magazine, will take the John Adams Institute stage to offer a unique insight into the American and Soviet "firsts" in space - from Sputnik through to the International Space Station and the Apollo program. After his talk he will have a moderated discussion with André Kuipers, the second Dutch astronaut to fly in space. In Protected content , Kuipers flew on a brief mission to the International Space Station (ISS) and in Protected content returned to the ISS, this time for 5,5 months. 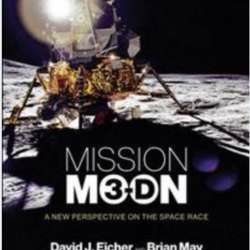 Eicher's book Mission Moon: Reliving the Great Space Race, illustrated with Protected content unseen 3-D photographs by Queen guitarist Brian May and Claudia Manzoni, takes readers on a skillfully narrated journey through the events which led to Apollo 11's lunar landing in July Protected content , when Neil Armstrong and Buzz Aldrin became the first people to walk on the face of the Moon. Book will be available for sale at the event.